Lacquer or Leave Her! : Supernatural Lacquer Wonderflonium! 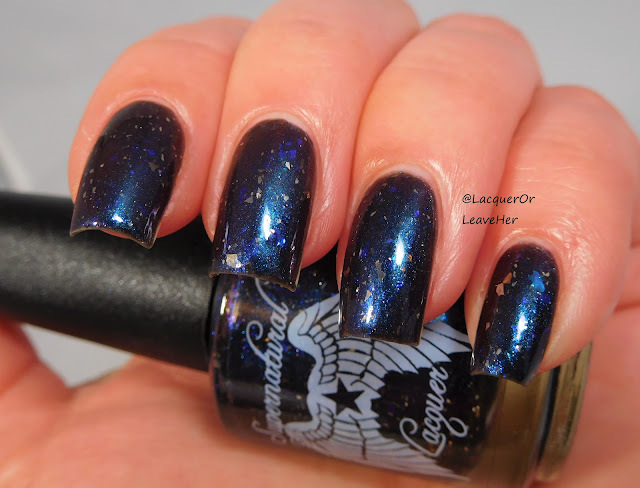 Today I have another Polish Pickup beauty to hare with you: Supernatural Lacquer's Wonderflonium! I'm wearing three thin coats in these pictures; you'll be fine with two. The application and formula are perfect--excellent control. This looks like a gorgeous galaxy made with gemstones, or a winter snowstorm with silver snowflakes. It's edgy and magical and girly all at the same time. And I was not wrong! I love how the different color flakes give this so much depth, even in matte. I love, love, love how those flakes combine with the stamping and make it look like a confetti of musical notes is falling from the sky! I love your stamping! One of my favorite musicals and this is a lovely tribute!